Dr. Walker made his heavenly transition from the Land of the Dying to the Land of the Living on Sunday morning, August 21st. at 8:08 A. M. in Philadelphia, PA.
A prolific preacher, Dr. Walker served as Pastor of the Nineteenth Street Baptist Church in Philadelphia for more than 30 years, retiring in October, 2010. He was a much sought after Revivalist, Lecturer and Pianist whose global ministry spanned across the World. A native of Chicago, Dr. Walker graduated from DePaul University with both a Bachelor and Masters Degree in Music. He continued his studies in Piano in Paris, France and participated in several International Piano Competitions throughout Europe. Dr. Walker accepted his call to ministry while teaching at Southern University in Baton Rouge, LA. He left Southern to attend the Colgate-Rochester School of Divinity where he earned his Master of Divinity Degree. He held several honorary doctorate degrees from various educational institutions and was the recipient of numerous awards. Dr. Walker was most known for his untiring commitment to Foreign Missions having served as Recording Secretary, Chairman and later as Executive Secretary of the Foreign Mission Board, National Baptist Convention, USA, Inc. During his tenure he certified numerous Missionaries assigned to the foreign field in various parts of Africa, coordinated the constructions of schools and a hospital and ministered across Africa during his tenure of more than three decades with the Foreign Mission Board. Survived by his wife; Mrs. Barbara Walker, two sons, Jason and Pierre Walker, two sisters; Dr. Nettie Walker Wood, Supervisor of the Children’s Division, National Baptist Congress of Christian Education and Dr. Carolyn Walker. Lie In State: 3:00 p.m. - 6:00 p.m.
Musical: 6:00 p.m. - 8:00 p.m. The Rev. Charles Walker — a pastor, concert pianist, composer and humanitarian who as a student led a protest that resulted in the addition of more black faculty members at Colgate Rochester Crozer Divinity School — has died. He passed away on Sunday in Philadelphia at the age of 76. The Rev. Walker was chairman of the Foreign Mission Board of the National Baptist Convention U.S.A. Inc., and he led numerous food and humanitarian aid missions in Ethiopia and coordinated the construction of schools, libraries and hospitals in various locations in Africa. 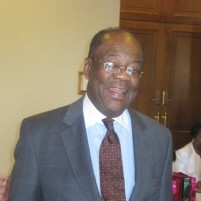 He also was pastor of the 19th Street Baptist Church in Philadelphia, from which he retired in October 2010.